Listen to Lost Boy by Ruth B while you read this. I couldn’t get it out of my head while I read Unhooked. Recently I have been in a pirate mood. I finished The Girl From Everywhere and Blackhearts. Let me tell you, when searching for good YA pirate books, there aren’t many out there… unless you want Fabio on the cover and then that is NOT a YA book. So in my searchings, I came across Unhooked. I am not usually one for Peter Pan and Neverland stories, but I figured it couldn’t hurt to give it a try. I finished Unhooked in 24 hours. Lisa Maxwell really draws you into the story through her narrative. And what’s great, there is more than one narrative being told. Unhooked is not your traditional Peter Pan/ Captain Hook story. It literally unhooks the classic stories you’ve heard before and spins them on their head. Maxwell shows that not all “heroes” are good and that not all “villains” are bad. It is a deeper look at the decisions a person makes and how those decisions change the course of a person’s life. The simple act of turning off a light, or signing a paper. At the beginning, the relationships between Gwen, the Captain, and Pan are very convoluted. You don’t know who is telling the truth and who is lying. And as the story unfolds, truths become complicated, lies destroy. The tension between Gwen and the Captain is swoon worthy. I couldn’t get enough of him. This is what I pictured every time. When I started reading, about 100 pages in, I tweeted that I was sure my heart was going to break before the story ended, and I was right. There is a twist I didn’t see coming and it changes everything. 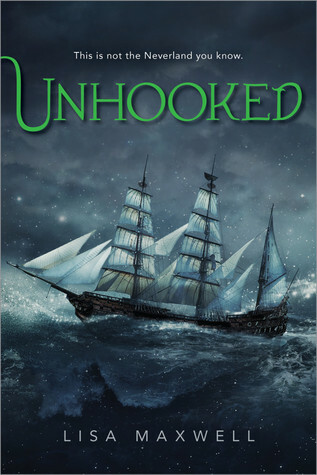 If you like retellings that go more in depth with the character development, that give characters their own backgrounds and their own internal struggles, definitely read Unhooked. If you like pirate stories, with heroes, villains, magic, and romance, also read this book.